Ananda and Crystal Clarity Publishers are pleased to announce the second in our series of online books. The first was Paramhansa Yogananda’s spiritual classic, Autobiography of a Yogi. Paramhansa Yogananda Ananda was founded by Swami Kriyananda, a direct disciple of Yogananda. Kriyananda was inspired by his guru to start “World Brotherhood Colonies.” Ananda, and its sister colonies throughout the world, are the fulfillment of Yogananda’s dream. See Chapter 48, in this 1946 edition, to read Yogananda’s own words on World Brotherhood Colonies. Kriyananda’s autobiography is perhaps the most complete biography of Yogananda. The author shares numerous stories and insights about his Guru. The New Path is also a fascinating story of one man’s search for Truth. Kriyananda recounts how as a young man he examined and discarded as false many of the promises offered by modern society. Gradually he realized that lasting human happiness comes not from outer success, but from deepening spiritual awareness. Eventually his searching brought him to the door of one of the spiritual giants of this century, Paramhansa Yogananda. 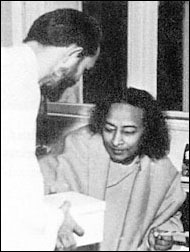 What ensues is Kriyananda’s spiritual training under Yogananda. Yogananda showed him a clear path to the attainment of spiritual ideals through the practice of the science of deep yoga meditation. The yoga philosophy and way of life are explained vividly through insightful stories and experiences of living with a self-realized master. The print version of The New Path is available from Crystal Clarity Publishers. The New Path includes over 100 photos, which are available in the printed version of the book. We hope you enjoy the free offering of this spiritual adventure. If you like The New Path, you might also enjoy the online Autobiography of a Yogi.